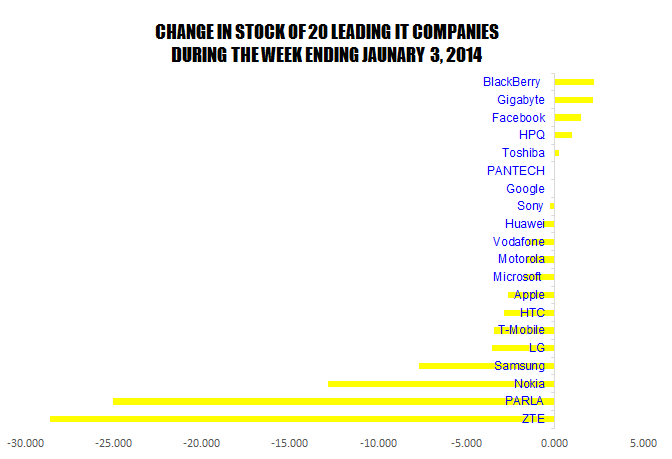 Mean change in the stock of 20 Leading IT companies fell by 4.273% while stock of 14 companies had the negative change while the stock of 5 IT companies changed positively during the week ending on January 2014. It seems that immediately after the end of shopping season of Year 2013, the shopping spree looks to be ended. The 5 companies which had the positive stock change are; BlackBerry, Gigabyte, Facebook, Hewlett-Packard and Toshiba while the stock of PANTECH had no change in its stock. The 15 companies which had the negative change in the stock were; Google, Sony, Huawei, Vodafone, Motorola, Microsoft, Apple, HTC, T-Mobile, LG, Samsung, Nokia, Parla and ZTE.